Remember Diaspora? Last year, just as the press started to criticise Facebook over privacy issues, a social network called Diaspora appeared on Kickstarter. It was just in time to be the plucky start-up positioned as an open, user-driven social network, diametrically opposed to Facebook’s evil empire. The coverage drove their Kickstarter pledges well over the target, and led to a proliferation of Diaspora branded t-shirts around the world. Diaspora’s privacy management is based on Aspects. The user groups their connections by a set of personal criteria, and can choose who gets to see which updates, and which stream of content they consume. Grouping people in this way isn’t really new; Google’s other social network, Orkut, employs a similar system, as does their new social project, Google+, with its Circles. Diaspora’s big point of difference is as a federated network. Anyone can take the software, install it on a server, and connect it to other installations, called pods. Now after almost a year and with Google+ live to a limited audience, how has Diaspora gone? Since launch the development of Diaspora has not stopped. The interface has been improved, Diaspora supports mentions and hashtags in status updates and searches on public posts. 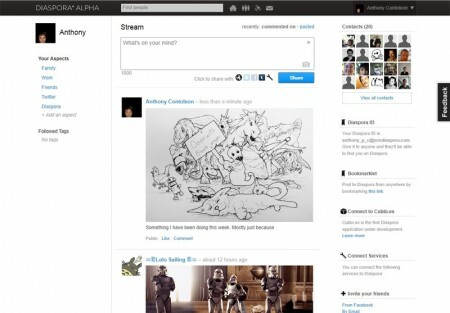 Users can post from Diaspora to Tumblr, Twitter and Facebook, and anyone’s public stream is available as an RSS feed. 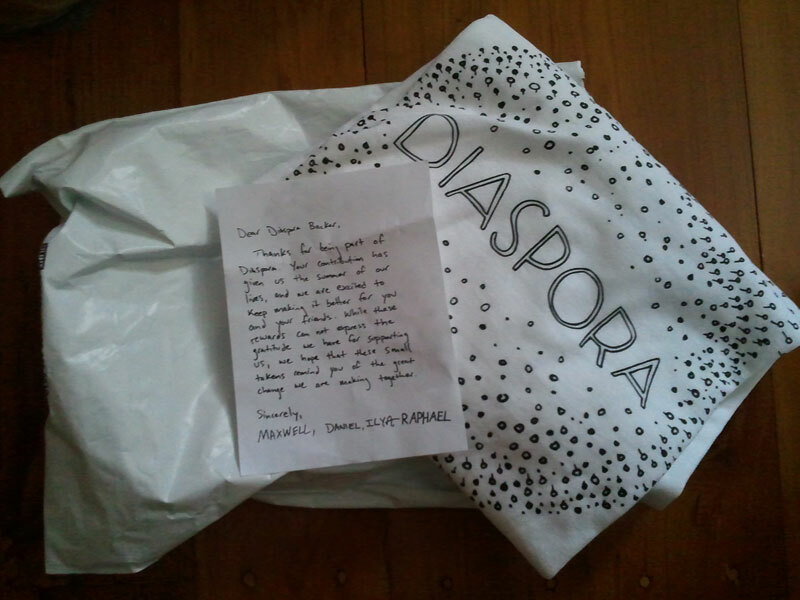 Diaspora has a few more tools than it had at launch that make it easier to share sites and images while not on the site. A bookmarklet and an awesome photo sharing tool called cubbi.es (It saves an image on shift+left click, posts it to your cubbi.es account, into your stream on Diaspora, and can back it up to your Dropbox account as well). But there is one part of Diaspora’s user experience that has been stagnant for a while, and that’s mobile. Personally Diaspora never really took off within my own social circles. No-one I know in real life, or through other social networks, is currently active within Diaspora. All the people with whom I currently interact on Diaspora, I met there, and they all sit in a ‘People from Diaspora’ Aspect. And now there is Google+. The project has had an awesome take-up rate and already has over 10 million users. A lot of my acquaintances who were on Diaspora but never really used it are now very active on Google+. Whether this is the result of a solid product on Google’s part, or simply of the initial hype, remains to be seen. Google+ does a lot of things differently to Diaspora (and Orkut) even if there is some overlap of the core mechanics of Circles vs Aspects. Notifications for activity on Google+ are visible while on other Google products, like Gmail and Google Reader, and can be acted upon without returning to Google+. Eric Schmitt’s “Put your best people on mobile” is obvious on Google+. The project’s mobile experience is awesome on both mobile web and the Android app (which I love). Google+ has a number of other features, the most talked about being their desktop video feature called Hangouts, and mobile group messaging feature called Huddle. 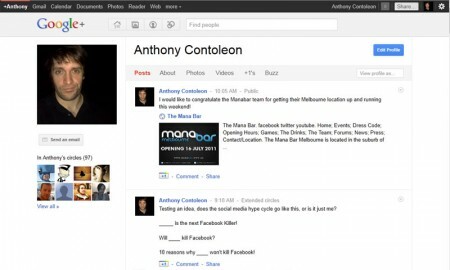 Google+ probably won’t ‘kill’ Facebook. The size of the networks most users have built on Facebook represents a massive switching cost should they wish to migrate to another platform. Google+ will, at least for now, be a second social network, similar to how many people have active LinkedIn, Twitter, Instagram and other social media profiles as well as their Facebook accounts. Where Google+ can clearly replace Facebook is on mobile. For ages the Facebook mobile experience has been bad, bordering on malicious. The only reason that Google+ isn’t actually replacing Facebook on mobile for me is because I stopped using Facebook on my phone ages ago. Facebook’s app and mobile website are horribly slow and unstable, and do not offer me enough as a user to make it worth the aggravation to use. Google+’s Android app is the opposite. It is fast, easy to navigate and use, and lets me see public posts by people near me and tag posts with my location. Diaspora is a solid, open platform that gives the user as much control as they want to take on, and judging from the work the team has put into it so far, will continue to improve. Google+ has a lot of awesome features on launch and has the benefit of the Google brand and integration with their other products. Both platforms have good reasons to use them and both cover areas that Facebook does not. Diaspora is more sensitive regarding user privacy and Google+ offers features that Facebook either doesn’t have, or does badly. The biggest difference between Google+ and Diaspora is that while both do things that Facebook does not, most people don’t care about the needs that Diaspora meets, whereas those Google+ cover are obvious from the start. There are a few small differences, like how Diaspora sorts posts either by the date of the post, or the latest comment, which Google+ does not do. There are also other similarities, in that both let the user export their data easily and fully, unlike Facebook. Diaspora does have a future, but it won’t be as large as Google+. Facebook will probably start to fill the gaps that Google+ seems aimed at, and this can already been seen in the rumours surrounding Project Spartan. For now though, Google+ will continue to gain users at a greater rate than Diaspora, and for all its flaws, Facebook isn’t going anywhere.